Product #18315 | SKU BR-4BATT-KIT | 0.0 (no ratings yet) Thanks for your rating! Includes; 4x E-HL10DS V-mount batteries and 1x VL-4S Quick Charger. KIT INCLUDES: Four IDX E-HL10DS Lithium-Ion Batteries and One VL-4S Four-Channel Quick Charger. The IDX E-HL10DS is a lithium ion, V-Mount battery. It offers 95Wh for 14.4VDC equipment in a compact package. A continuous draw of up to 10 Amps. Longer overall lifecycle operators can expect about 10% longer battery viability when the 500-cycle level is reached. 3 Power Status LEDs are located on the side of the E-HL9S, shown in increments of 20%. Battery circuit protection against common causes of battery misuse, guarding against over charge, over discharge, over current and exposure to high temperatures. 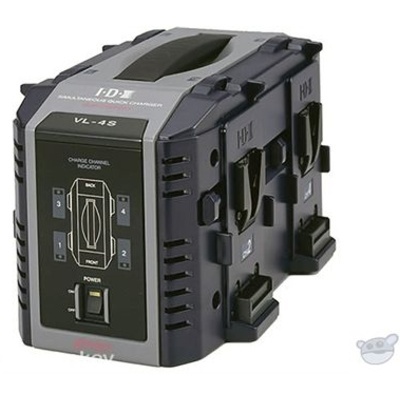 The VL-4S is a four-channel, simultaneous Lithium-Ion fast charger. Up to four Li-Ion Endura V-mount batteries can be charged in 2.5 hours or less. a lightweight design (3.1Kg) with a built-in handle. An LED condition indicator offers a quick glance of each battery's charge status. A recessed power switch to prevent accidental loss of power. Auto-sensing AC power (AC 100-240V).